It's a feeling many of us have experienced: you lose something valuable or sentimental and you panic. 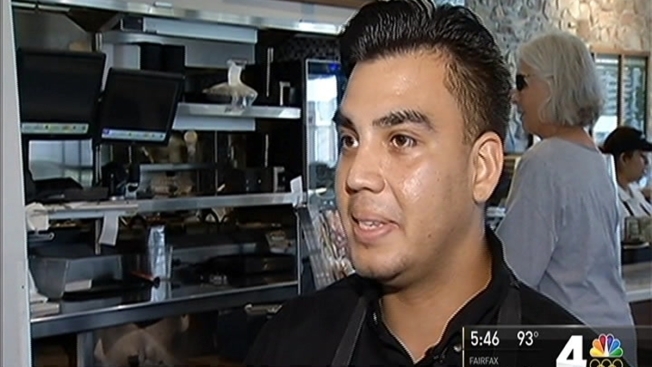 A man experienced that dreadful feeling Tuesday night when he accidentally threw away his wedding ring at Cafesano, a restaurant in Reston, Virginia. "He grabbed me. He said, 'I think my wedding ring is lost in your trash can,'" said Sergio Alvarado, manager for Cafesano. The man said he had dried his hands with napkins and worried he tossed the ring in the trash along with the napkins. "You could tell it was very upsetting for him and his wife," said Jennifer Walter, who was sitting with her husband at a table nearby. Alvarado and Christian Rosa, a food runner for the restaurant, quickly stepped in to look for the missing ring. Rosa eventually took the trash bag outside and sifted through it. "He started taking everyting from a trash bag into another trash bag until he found it," Alvarado said. "Honestly, I didn't think he was going go find it and then he came back to me where I was and he showed me that he had it." Alvarado said when they delivered the lost -- now found -- ring to the man, he was very emotional. The ring had been on the man's finger for 55 years. Meanwhile, Walter and others watching were stunned at Rosa's gesture. "It's this little ring and a whole pile of trash. I mean, what are the odds of being able to find it and just the fact that he went through that effort to do that was pretty astounding," Walter said. When asked if it was one of his best days at work, Rosa said, "Yes, because I like to help other [people]."